Murdoch has been giving evidence in the phone hacking scandal. A DEMONSTRATOR HAS attacked News Corporation owner Rupert Murdoch whilst he has been giving evidence to MPs investigating the phone hacking scandal in the UK. The man had shaving foam on his face as he threw a pie at Murdoch from close range. He was slapped by Murdoch’s wife before he was escorted out of the committee hearing room in handcuffs. Murdoch and his son James have been giving evidence to MPs on the House of Commons Culture, Media and Sport select committee investigating the phone hacking scandal involving the News of the World. Email “WATCH: Rupert Murdoch pied by protester whilst giving evidence to MPs”. 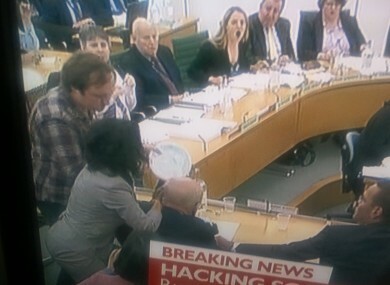 Feedback on “WATCH: Rupert Murdoch pied by protester whilst giving evidence to MPs”.